Edge Rewards is Full Tilt Poker’s VIP program. All players can increase their VIP level, convert points to cash for cashback, and the more you play the better the perks become. 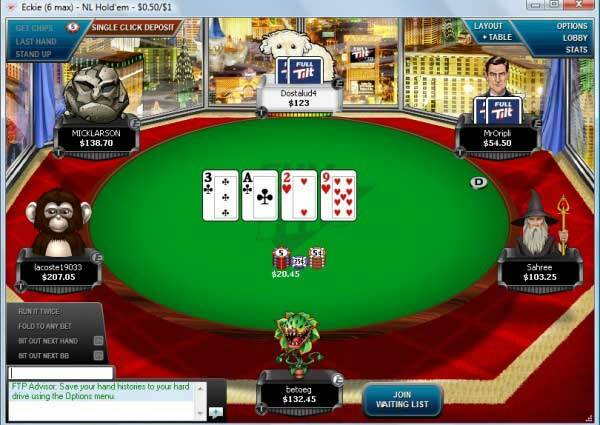 It’s worth noting that Full Tilt Poker doesn’t offer rakeback. Instead, their VIP program is very similar to rakeback, where the amount of points you collect determine the amount of weekly payments you receive. You earn these points by generating rake in either real money cash games, or by entering real money tournaments. As you can see above, the more FTPs you average per day, the higher your Status Level. For example, if you wanted to achieve Platinum Level, you would need to average 150 FTPs per day for 30 days or 100 FTPs per day for 100 days. Note: Full Tilt Poker does not offer rakeback directly. However, their VIP levels, described below, will allow you to convert points for cash which is basically the same thing. We will refer to it as “rakeback” even though it’s not standard rakeback. The Edge Rewards program is tiered into 6 status levels, and the more you play, the more you earn. The status levels are worked out based on a rolling average of the Full Tilt Points (FTPs) you earn over 30 and 100 days. Achievable by any player because it only requires to maintain a 30-day rolling average of 1 FTP. In other words, all you have to do is earn 1 point in a month and you will get the Bronze status. However, Bronze players do not receive any cash payments and receive very little benefits. Bronze level players can earn up to 0% rakeback. A slightly higher 30-day average of 35 points is required to achieve Silver status, but should be achievable by anyone at any level. Once reached, you will only be required to maintain a 25 point 100-day rolling average to keep this status. With this status comes a rakeback payment of $1 per 100 points or 10%. Silver level players can earn up to 10% rakeback. A 75 point 30-day average required to reach this status means that a little more effort will be required. You can maintain this status with a 50 point average over a 100-day period, which is not that much. With the Gold status comes a $1.50 return for every 100 points earned. Gold level players can earn up to 15% rakeback. Reaching Platinum status requires a 150 point rolling average over 30 days and a 100 point average over 100 days. With that comes a $2 return for every 100 points earned. Platinum level players can earn up to 20% rakeback. Diamond status players maintain a 350 point rolling average over 30 days or a 250 average over 100 days. With this you get 25% rakeback ($2.50 return for every 100 points earned) and access to the exclusive Diamond Edge store. In the Diamond Edge store, you can also receive cash bonuses for Full Tilt Points, adding up to an additional 4.55% in rakeback. Diamond level players can earn up to 29.55% rakeback. Black Card is the highest level, achievable only by maintaining a 500 point average over 100 days. Black Card players receive the same points to cash conversion as Diamond, $2.50 per 100 FTPs. They also have access to the Diamond Edge store and exclusive cash bonuses. However, in addition to these perks, Black Card players can also enroll in Black Card Rewards. Here you can opt-in to the Monthly Edge Leaderbaords and compete for your spot at the top. In all, the top 25 eligible players will receive a status level upgrade at the end of each month. The top 3 will win cash prizes: 1st place pays $500, 2nd $300, and 3rd $200. Black Card players also earn double FTPs for their play, effectively doubling the cashback percentage. However, the biggest advantage of Black Card is the Black Card Sponsorship Program. In order to qualify, you need to finish in 1st place in any of the leaderboards over a four month period. By doing so you will win a sponsorship contract where you earn 100% cashback over four months and exclusive Black Card merchandise. Black Card level players can earn up to 59% rakeback. Black Card Sponsored players can earn up to 100%+ rakeback. You can always check your 30 Day, and 100 Day averages in the Full Tilt Lobby, shown below. You have to maintain your 30 or 100 day averages in order to stay at that VIP level. Let’s say that you have achieved Diamond status by maintaining the needed 30 day rolling average, but by the end of the same 30 days, you have decided to take a break and your average fell down below 350. This means that your Diamond status will be replaced with Platinum until you bring up your average. Also, this means that rakeback will be calculated differently depending on the status that you have. If you have played 3 days with a Diamond status and the next 4 with Platinum status, by the end of the week you will receive 3 days worth of 25% rakeback and 4 days worth of 20% rakeback, so don’t forget to check your rolling averages! Full Tilt Points (FTPs) are earned by paying rake at cash games or paying fees in tournaments. They are awarded at the rate of 10 FTPs per $1 in contributed rake/fees. So if you play a $50+$5 SNG, you will earn 50 FTPs. Cash games are a bit more complicated, but it’s based on the amount you contribute to the pot/rake. If you’re playing 3 handed and each player contributed 1/3 of the pot that is raked $3, each player paid $1 in rake and will earn 10 FTPs each. Your weekly cash payments will be made automatically and you can keep the points you earn. These bonuses are only available to Diamond or Black Card VIP players! All bonuses clear at $0.04 per Full Tilt Point earned. As shown in the Rakeback Equivalent column, the $5,000 bonus is much more valuable than the $50 bonus. At the $50 level, the bonus is worth 3.33% rakeback, compared to the $5,000 level which works out to 4.55%. This means each FTP is 24% more valuable at the highest level. However, not everyone will be able to earn 1.1 million FTPs. Find the right balance between value and how many FTPs you can possibly earn. If you aren’t a Diamond VIP or above, or are not interested in clearing bonuses, another option is choosing Ring Game tickets. These tickets can be used to play at any cash game table and basically act just like regular money, so long as you use them to buy-in to cash tables. However, you can only use them on cash game tables for the specific “Game of the Week”. 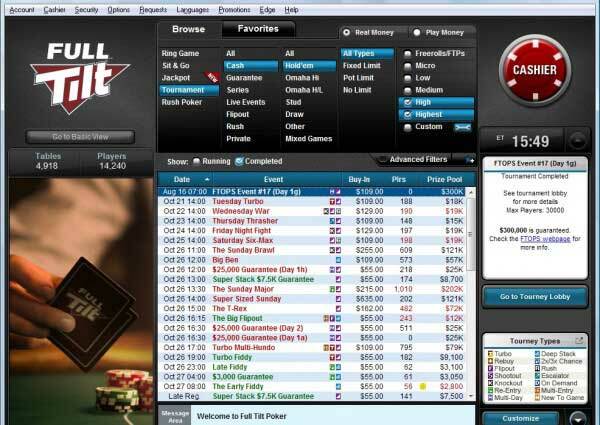 This game changes each week and varies between all games offered at Full Tilt Poker. So the game could be Limit Hold’em, Stud Hi, 2-7 Single Draw, etc. Players also earn double FTPs playing the game of the week. You can see what the current game of the week is here. Important Note: Tickets have an expiration! If you do not use a ticket within a 7 day period to earn at least .10 FTP, the ticket will become invalid and “permanently lost.” Don’t cash in your FTPs and then lose your ticket! You can also purchase tournament tickets. Similar to ring game tickets, these can be used to buy-in to any SNG or MTT, just like cash. Also similar to cash game tickets, you can also buy Game of the Week Tournament Tickets at a discounted rate. Again, these tickets are only valid playing in the current “Game of the Week” which changes each week. Just like cash game tickets, tournament tickets also expire in 7 days with no use! Once converted, these chips can only be used to gamble in the Full Tilt casino. The starting time for the Sunday events alternates each week. The Full Tilt Store also contains cool merchandise and gear, which can be purchased with FTPs. Overall, you can earn anywhere from 10% – 100% rakeback through Edge Rewards. The lower levels Silver and Gold are achievable at just about any stake and game as long as you play regularly. 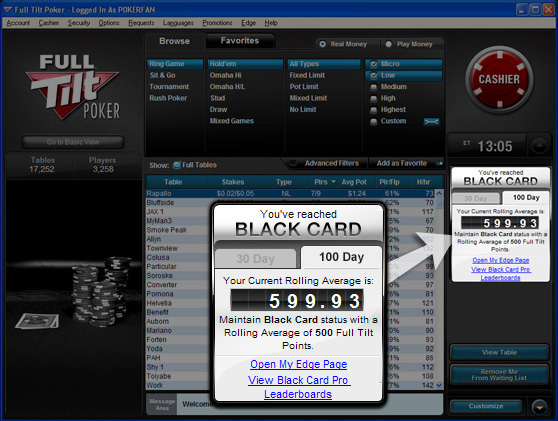 However, achieving 100% Full Tilt Poker rakeback through Black Card is only for the most consistent grinders.